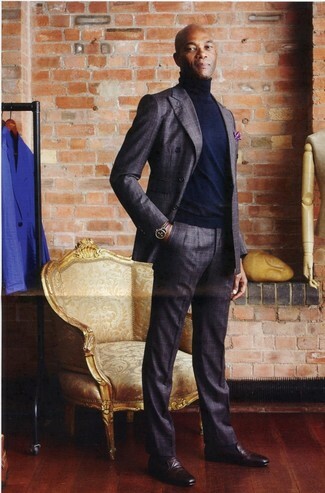 A navy turtleneck looks especially refined when married with navy dress pants in a modern man's ensemble. If not sure about the footwear, complement your ensemble with a pair of dark brown leather derby shoes. 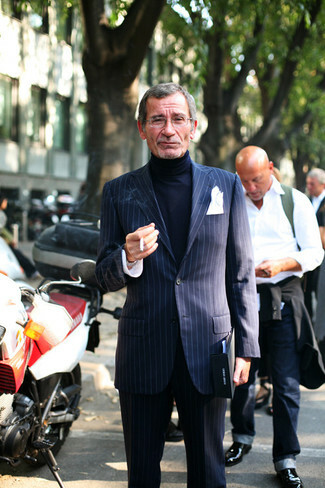 Putting together a navy turtleneck and navy and white vertical striped dress pants is a surefire way to breathe a polished touch into your styling collection. 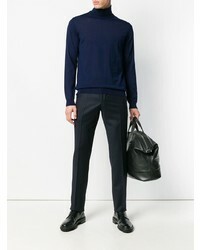 Marry a Lanvin Classic Turtle Neck Jumper from farfetch.com with black chinos for a daily ensemble that's full of charisma and character. Ramp up this ensemble by rocking brown leather casual boots. 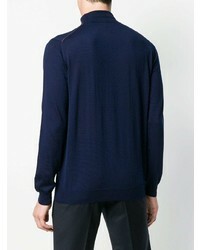 For an ensemble that's nothing less than GQ-worthy, team a navy turtleneck with navy dress pants. 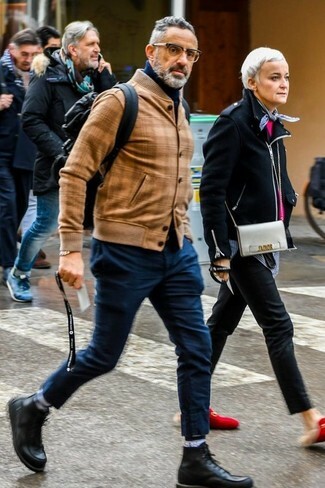 If you're clueless about how to finish off, a pair of black leather derby shoes is a smart pick. 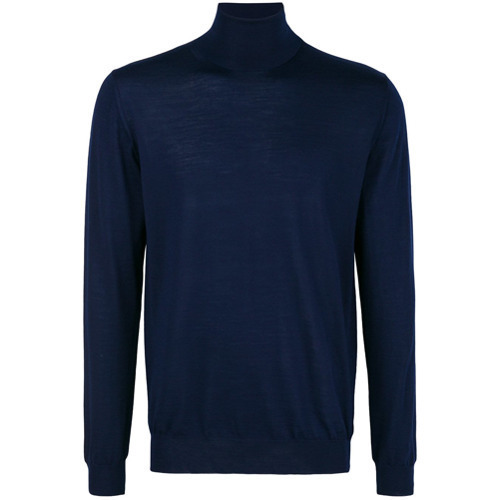 This relaxed combination of a Lanvin Classic Turtle Neck Jumper from farfetch.com and navy chinos comes in handy when you need to look cool and relaxed in a flash. 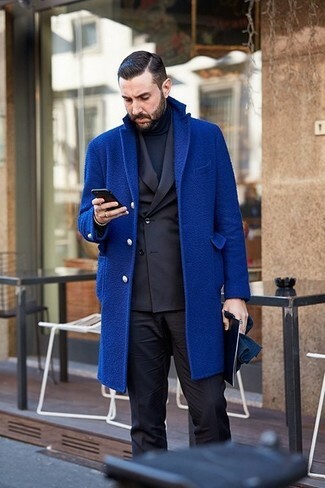 If you wish to easily spruce up this look with a pair of shoes, why not introduce black leather casual boots to the equation? 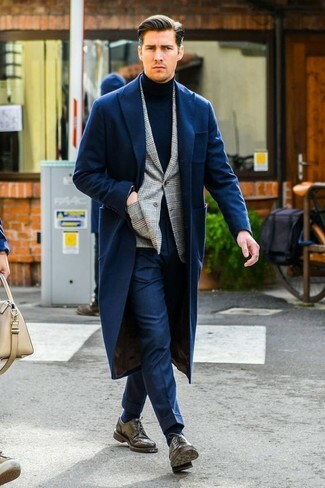 Marry a navy turtleneck with charcoal dress pants for rugged sophistication with a modern twist. Burgundy leather double monks will be a stylish companion for your look. 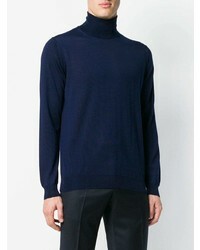 Go for a Lanvin Classic Turtle Neck Jumper from farfetch.com and a blue overcoat to feel confident and look dapper. 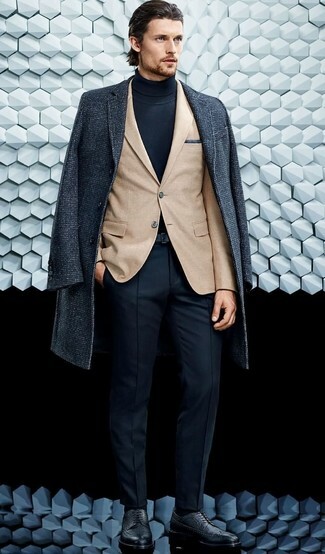 This combo of a Lanvin Classic Turtle Neck Jumper from farfetch.com and a charcoal plaid wool suit is a safe option when you need to look truly stylish. 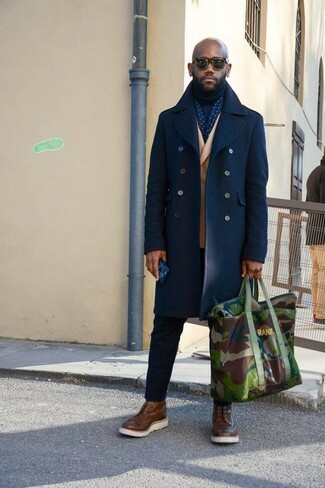 Don't know how to complete your ensemble? Rock a pair of burgundy leather loafers to ramp it up a notch. 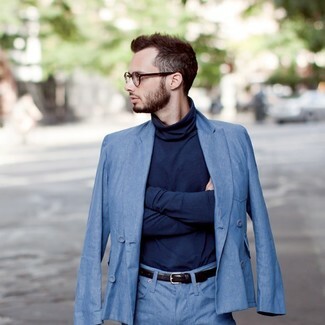 You're looking at the hard proof that a Lanvin Classic Turtle Neck Jumper from farfetch.com and light blue dress pants look amazing if you pair them together in a classy outfit for a modern guy.